9 Nov 2016 Amsterdam - Researchers at CWI and AMC used large-scale computer simulations to discover how cell types work together to form new blood vessels. Understanding vascular growth is essential for understanding and manipulating processes such as tumour growth, wound healing, and a number of eye diseases. The results of the simulations were published in the online journalPLOS ONE. Computational modelling and simulations are increasingly important in the life sciences. Simulations allow for the development and testing of hypotheses in much more complex situations than lab experiments. They can be repeated many times with varying properties to generate large amounts of data in which new discoveries can be made and various hypotheses can be tested. Researchers of CWI and AMC used computing clusters to conduct a large number of virtual experiments on blood vessel growth. Vascular growth involves two types of cells: tip cells that lead the growing sprout and stalk cells that follow behind. Experimental biologists could not agree on the mechanism by which stalk cells chase the tip cells. 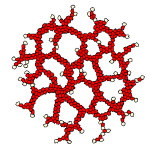 The researchers in this project modelled the growth of a vascular network and performed virtual experiments using this model. By systematically varying the properties of the involved cell types, they discovered which properties are responsible for the observed task division between tip cells and stalk cells. Tip cells are less attracted to other cells than stalk cells, and tend to move away. The stalk cells however are attracted to the tip cells and follow them, in effect pushing the tip cells even further away, causing the blood vessel to grow. The first lab experiments, in which the activity of the attractor genes in the cells were manipulated, seem to confirm this hypothesis. Understanding how blood vessels grow is important for medical researchers who want to influence this process. Examples are slowing down blood vessel growth to starve tumours, increasing growth to speed up wound healing, or, as the medical researchers in this project, to understand how the process can derail to cause eye diseases such as diabetic retinopathy.